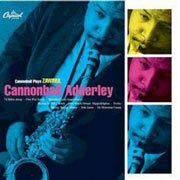 Blue Note Records has released Cannonball Plays Zawinul, a compilation of tunes written by Joe during his nine and a half year stint as pianist for Cannonball Adderley. The collection includes ten pieces, five of which appear on CD for the first time. (I can finally hear “74 Miles Away” again.) 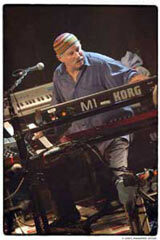 For more information, visit the Cannonball Plays Zawinul page on the Blue Note web site. The Syndicate is holding forth at Catalina Bar and Grill this week, and Zawinul fan Pete van Nuys of van Nuys Communications, sent in this report. The Zawinul Syndicate opened their spring tour at the new Catalina Bar & Grill on Sunset last Tuesday, and this may be the most accessible, most watch-able Syndicate ever. Its six members seem to balance perfectly, and singer Sabine Kabongo mitigates the testosterone without canceling any of the power you expect from Zawinul. I caught the 8:30 shows Tuesday and Thursday and was struck both nights by how young the group is. If Joe wasn’t on the stage they’d look like a rock band: Amit Chatterjee, lead guitar and vocals; Linley Marthe on bass; Nathanel Townsley III, drums; Manolo Badrena (the ol’ guy), percussion; and “girl singer” Sabine gyrating on percussion, too. But with Zawinul present these pros are strictly business, even when it looks like they’re having fun. Communication buzzes among all band members, but especially between Joe, Sabine, and Amit. “Intro to Tower of Silence/Tower of Silence” medley with Chatterjee’s guitar ranging from sitar to Iranian-flamenco-banjo, and his haunting vocals, at first melodic and evocative of his native Calcutta, then bullfrog croaks bouncing off Z’s sampled chorus. “All About Simon” featured a huge big band swing that soaked the new Catalina B&G in giant water balloons of sound. A brief “3 Postcards” that was classic Joe: Viennese accordion player one second, the whole damn Basie band the next. Linley got huge applause both nights with solos that caused my 18-year old son—a budding tenor sax man—to say “I didn’t know you could make a bass sound like that. He was really good!” Indeed, Linley’s got the chops. But they all do. Manolo brought back Weather Report memories with exuberant vocals and precision percussion solos, and kept the rhythmic tension high throughout the set. Especially infectious was the song “Yelena,” with its rhythmic hitch enhanced by Sabine’s vocal delivery. And Sabine’s duet with Joe’s sampled vocal chorus on “Café Andulucia” stood out, too. Needless to say, the Syndicate got standing Os both nights. If Zawinul were a painter he’d turn out massive multicolored murals eight feet tall and twenty feet wide. His son Ivan Zawinul mixed them down to fit perfectly within the walls of the Catalina this week.